The teak decks on Redemption are not in the best of shape caulk wise. There’s no telling how long it been since they have been redone, heck they may still be original caulk. With that unknown, I decided to have a small night project, since I finished the last one, and dive right into this process. 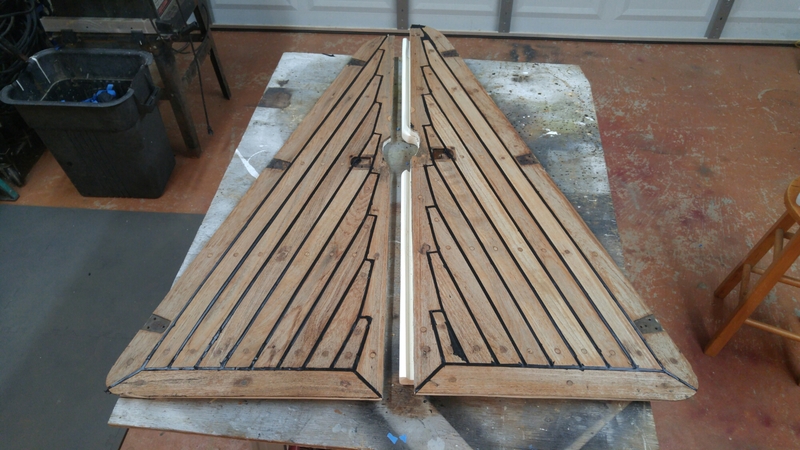 I used a couple blogs(SV Yohelah’s and Sundowner’s) for help and references while also using Teak Deck Systems instructions. On Redemption there is a large deck locker on the bow for holding line, spare anchor(our Fortress FX-37), etc. It has two hatch doors that open up in a butterfly type fashion. These have 3 hinges on each which allows them to come off fairly easily with just a few screws. Taking these off and bringing them home allowed me to work on them at my leisure at night when I left the boat for the day and also gave me insight on just what kind of job I was looking at in regards to the whole deck. 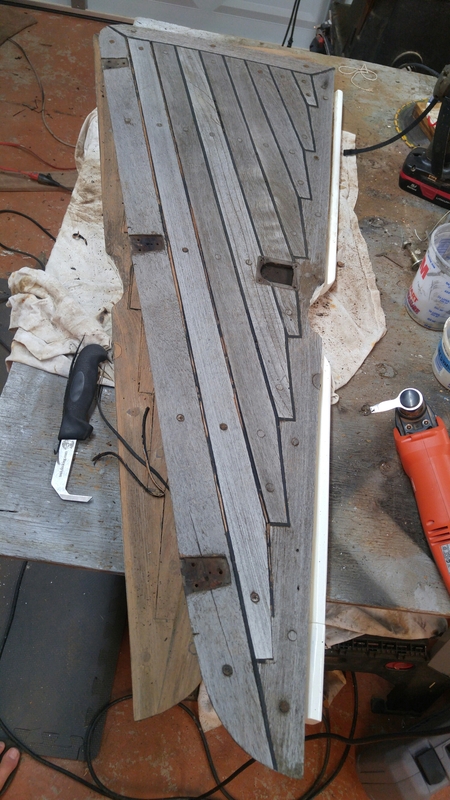 I used my Fein Multimaster tool with a teak caulk remover blade, which works like a dream by the way, to remove the old, dry, and cracked caulk. 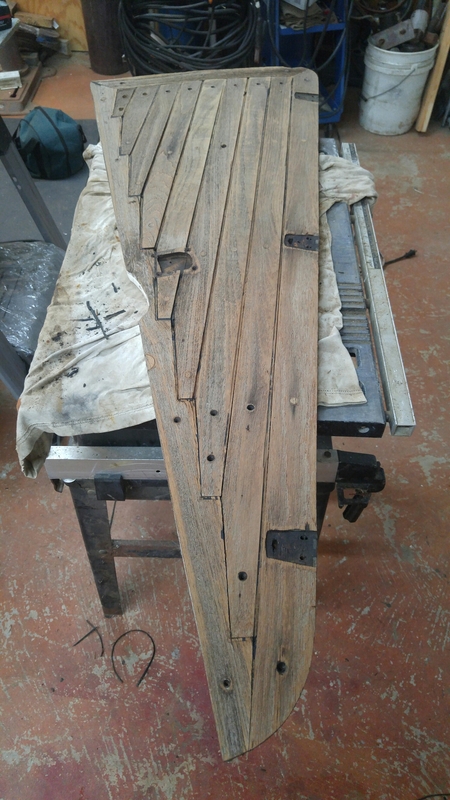 I also used the the caulk reefing hook from Teak Decking Systems(TDS) to get the small remains left over from the Fein. Now with both of these tools, you need to be patient and very careful. The Fein can and will start digging into the wood below the caulk and to the sides if you are not careful and paying attention. The hatches were in some pretty rough shape seam wise, the wood was so worn down in places there was actually no seam left to hold any caulk. Also, there was some screw heads showing from the plugs being worn completely down as well. 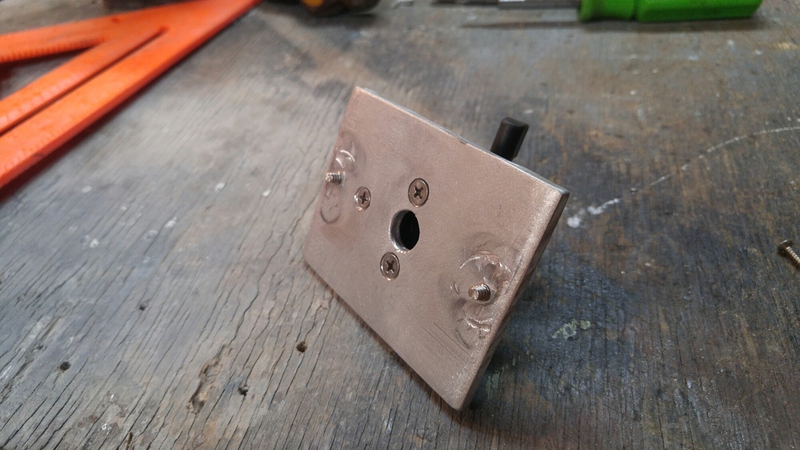 I removed the thin or missing plugs and screws on both hatches and countersunk the holes again to allow new 316 stainless-steel screws to be fitted and new plugs to be glued back in with DAP Weldwood plastic resin glue for a serious holding. When cured, I cut the plugs down with a chisel and hammer and sanded them fairly smooth but not a finished sand. 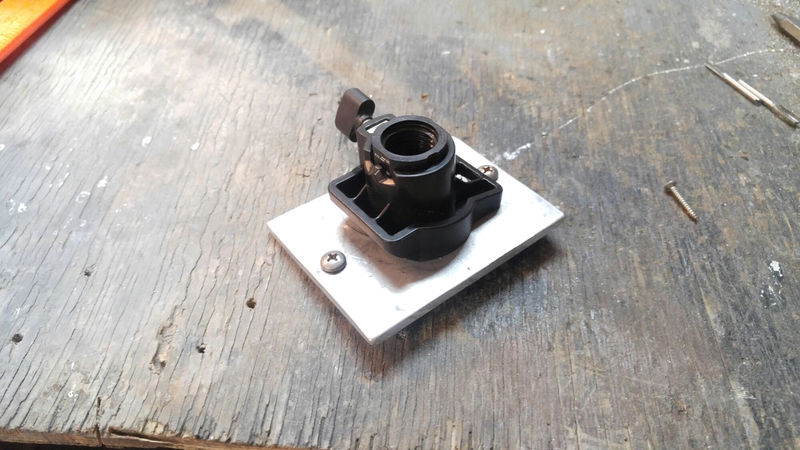 I did this in order to run a router with a 3/16″ cutting bit to bring the shallow seams to the proper depth and the non existent seams back to life. 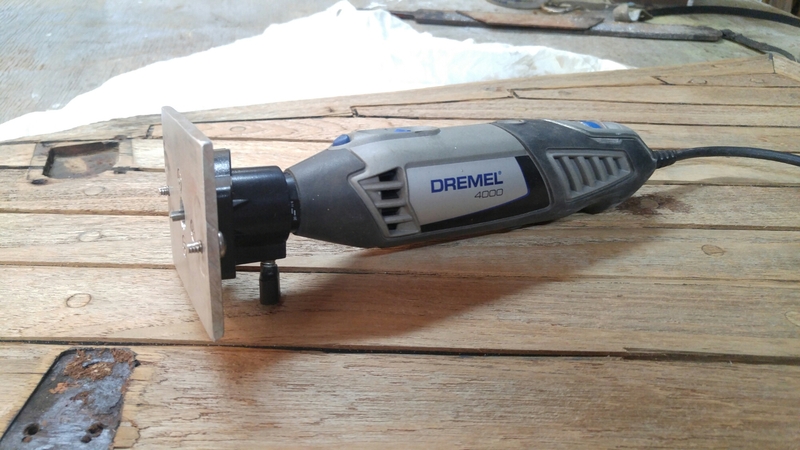 I made a jig with a plate of scrap aluminium and a couple screws to attach to the bottom of my Dremel tool. This takes pateince and care as well. you can’t dig too much too fast or it will heat up the bit and dull it in no time. Also, it may cause the Dremel to walk on you making crooked lines. When that was complete and the seams were close to uniform and at a depth between 3/16″-1/4″ I started to do the sanding. I sanded the tops of the deck with 80 grit very lightly, just enough to remove the old worn grain to have a nice semi-smooth finish and remove some of the raised edges. The seams were then sanded with the seam sander to get the sides straight and uniform for the caulk. When everything was sanded well and smooth, I took both hatches and cleaned and scrubbed them with a medium bristle brush and a bucket filled with a solution of warm water, TSP, and bleach. (I used the directions on the TSP box) I did this twice to make sure I cleaned every part of the hatches. 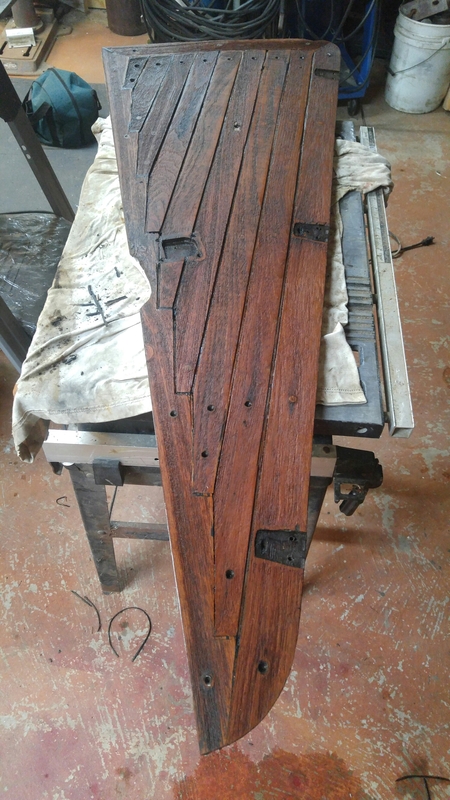 This not only got rid of grime, wood dust, and possible mildew but it also brought the teak back to life by giving it its almost new golden color. Sanded, cleaned, and now dried, the hatches were wiped down generously with a rag and acetone to remove any surface oils from the wood and grimey fingers. I then put some bond breaker tape(3m fine line tape) on the bottom of the seams. This prevents the caulk from sticking to the bottom, TDS recommends this because the caulk has better elastisity during expansion/shrinking when only being pulled in two directions instead of three. After that, I taped the edges of the boards with regular painters tape so I didn’t have to sand as much and had a better clean up after caulking. Caulking was next and let me tell you it was quite a forearm workout squeezing that gun the whole time. I didn’t have my good caulk gun as it was on the boat so I had to use a cheap-o caulk gun that didn’t work as well. 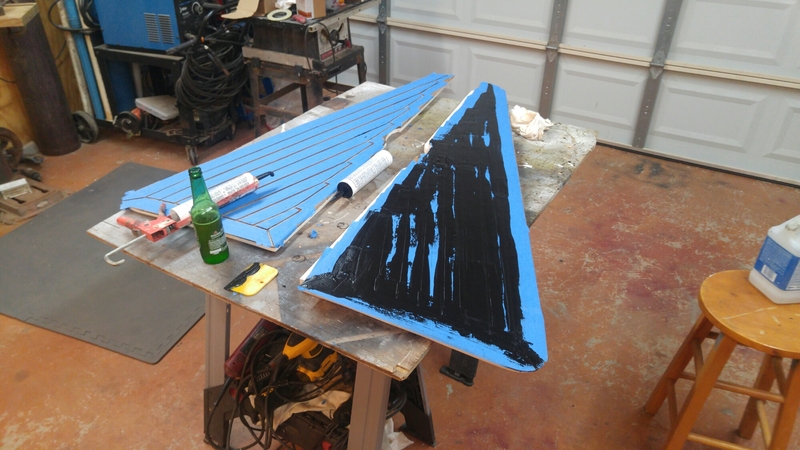 If you couldn’t have guessed, I used TDS SIS-440 black caulk to do this project and will use the rest of the two cases for the rest of the boat. Nevertheless, I pulled the caulk down the seams making sure not to stop or change directions in order to prevent any air bubbles. After, I finished a couple lines I came back over it with a putty knife to smooth and press the caulk in the seam. I started out with a yellow plastice putty knife but ended with a metal one, I think the metal one worked better for sure. When all the seams were caulked I started removing the tape from where I started caulking in the beginning. As I was taking the tape off, which can be messy so take caution, I knew immediately that this was going to look great! After it was all off and I let the caulk cure for 2 days I sanded them again lightly with 80 grit (per TDS instructions) and was super excited at how they looked. It was definitely worth the effort to do this and this gave me some more motivation to do the rest of Redemption’s decks. They just looked fantastic and new, not to mention it didn’t hurt your bare feet to walk on them like the old, raised, hard caulk from before.